PASCO- Benton/Franklin County Libertarians took to protesting the "Free Speech Zone" at Columbia Basin College today. "Free Speech Zones" or "First Amendment Zones" are essentially restricted areas on college campuses where people can host rallies or protests. "We are not going to stop until we get these policies changed," said group treasurer Ryan Cooper. Columbia Basin College has restrictions for "non-college" groups wanting to voice their opinions on campus. Groups must register 24 hours before an event and the event can only last five hours. The Benton-Franklin County Libertarians started protesting the zone in November when they were petitioning for "Legalize Richland." They were only allowed to do so on a cement platform behind building "A." "It infuriates me that money is going to a college that limits free speech to one small area of campus. That is totally unconstitutional and wrong," says Cooper. He is familiar with these "free speech zone" battles. Cooper won a lawsuit arguing against one at his Alma mater, Missouri State University, in 2003. CBC has these rules written into the Washington Administrative Code. This code was approved in 2016. 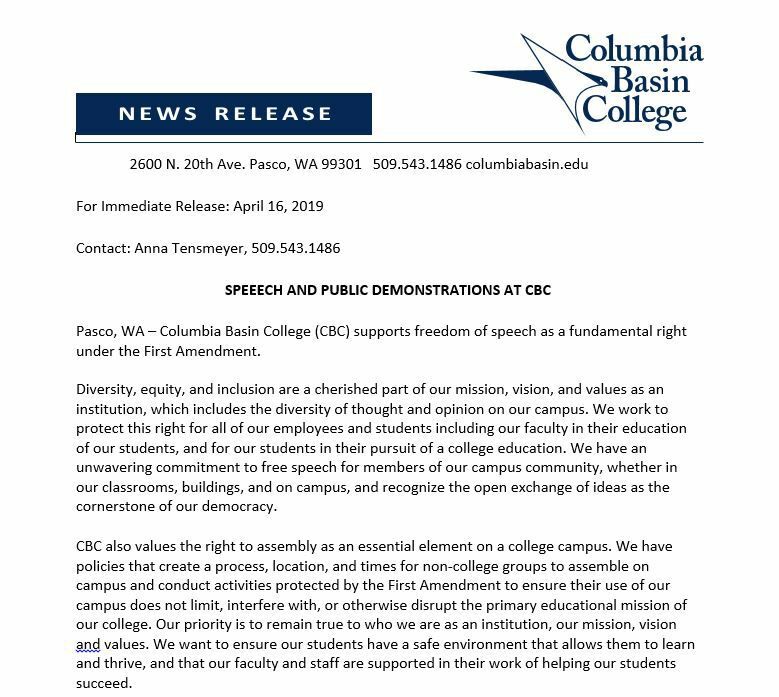 The college released a statement today saying in part, "CBC also values the right to assembly as an essential element on a college campus. We have policies that create a process, location, and times for non-college groups to assemble on campus and conduct activities protected by the first amendment to ensure their use of our campus does not limit, interfere with, or otherwise disrupt the primary educational mission of our college."